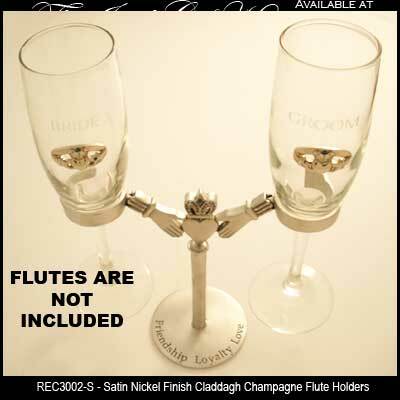 The Claddagh flute holder is an elegant way to display your toasting glasses during your wedding celebration. The Irish champagne flute holder features a satin silver finish over solid brass and it includes the words Friendship, Loyalty & Love engraved on the base. The Claddagh toasting glass holder stands 6" tall and it will accommodate most champagne glasses.